Hasselblad is the only camera brand that British photographer Gered Mankowitz has ever used. With his Hasselblad, he has captured some of the most iconic rock music images in history, including that of The Rolling Stones and Jimi Hendrix, that have helped to define an entire era. After an education ‘of sorts’ at several London co-educational ‘progressive’ schools, Gered left at 15 with no formal qualifications. However, he’d discovered whilst on a school trip to Holland that he had a natural eye for a picture, and with the Sellers’ experience still fresh in his mind, he determined that photography was the way to go. Having convinced his father to support him, there really was only one camera that he could possibly envisage using, and so he started out in his new career as the proud owner of a Hasselblad 500C. The Hasselblad felt natural in my hands straight away. The fact that I was using this imposing camera was probably more intimidating to the people I was photographing than it was to me. I just wanted to use it for the quality of the pictures it could produce and I couldn’t get over how beautifully designed and easy to work with it was. As he began his career, Gered had the opportunity to sample many different genres of photography. He spent some time being mentored by photographer Tom Blau, working at the famous Camera Press agency that he’d founded, and he also undertook some professional work while on a family trip to Barbados, including photographing the first Boeing 707 to land at Bridgetown Airport. He then assisted the famously dapper fashion photographer Alec Murray on an assignment to photograph the autumn collections in Paris, but ultimately came back disillusioned, convinced that his future lay elsewhere. Shortly afterwards, Gered went to work for showbiz portrait specialist Jeff Vickers MBE Hon FRPS, and this gave him the chance to photograph a stream of actors and personalities. Tellingly, it also introduced him to folk rock act Chad and Jeremy, who had just signed with Ember records. One of his pictures ended up being used as the cover of the duo’s first album and Gered found himself working in the music industry at a time when it desperately needed innovation. It was a chance to work with a new generation of producers/managers, and the fact that he was the same age as many of the performers he was photographing gave him the edge over many of the ‘old school’ established photographers. Within a few months Gered had begun to make a name for himself in the music business, and the list of performers he was working with grew steadily. A chance meeting with Marianne Faithfull was particularly fortuitous since it ultimately led to several photo sessions and an introduction to her manager and producer Andrew Loog Oldham, who also managed and produced The Rolling Stones. Gered found himself at the very epicentre of the swinging Sixties, experiencing first hand an era that was to change the world forever. “It was an extraordinary time,” he says, “though none of us realised back then how momentous and influential it all was. There was the feeling that you could do anything; the rule book had been completely thrown out.” One shining example of this principle in action was Gered’s shot for the cover of The Rolling Stones album ‘Between the Buttons.’ “I was confident enough by this time to bring some of my own ideas to the sessions,” he says, “and I’d prepared this homemade filter that I’d smeared with Vaseline, so that when it was held in front of the lens it created a soft focus and a ‘druggy’ kind of feel." The album cover was one of the most important vehicles for photography during this time, and its 12x12in format was an impressive showcase for an image. Coincidentally it was also exactly the same shape as a Hasselblad 6x6cm negative, allowing it to be scaled up with no crop required. When a photo session came together, there was always the thought that one of the shots might have album cover potential, and with the Hasselblad 6x6cm format, pretty much every shot had the potential to be dropped in. It was a thought that was at the back of Gered’s mind when he was asked to photograph the iconic Jimi Hendrix and his band. Despite a career that’s lasted for over half a century, and which has seen him scale not just the heights as a music photographer but also have an equally strong separate career as an advertising and editorial photographer, Gered has stuck with one camera brand throughout. And he has only ever worked with four film models: the original 500C, one further 500C, a 500C/M and a 500EL/M. Now he also has a digital H3D for personal work. I never switched camera systems because I just couldn’t find anything better. There was no reason for me to explore any other option; I prefer to work with stuff I feel comfortable with. The Hasselblad 500 series began with the revolutionary 500C, one of the most iconic cameras in photographic history. 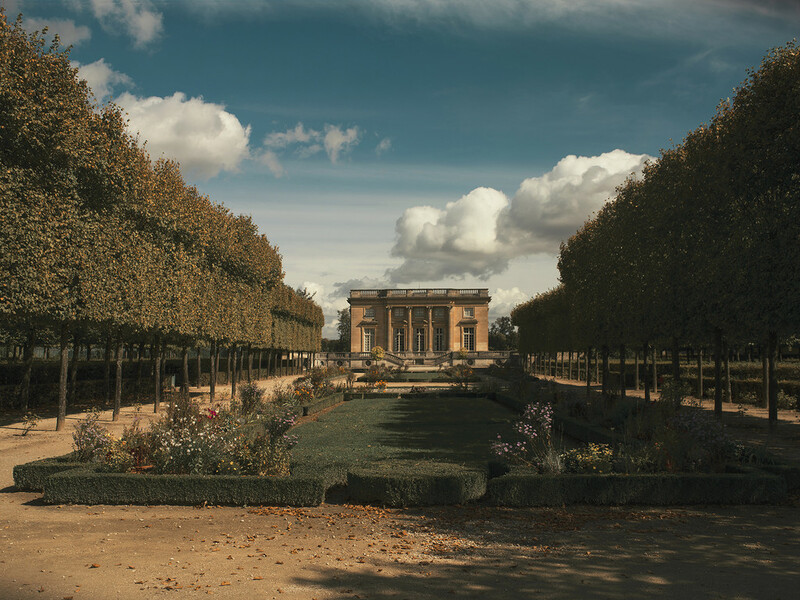 Enchanted by the Chateau de Versailles, Julie-Christine began a photographic love affair with the historical palace grounds in 1998 that continued over the last twenty years using six different Hasselblad cameras.